Earlier this week, Destiny 2 Black Armory NPC Ada-1 started selling the Forge bounty for the coveted Hammerhead machine gun. If you haven't heard, the last time she sold this bounty was somewhere around the Cretaceous era. In an effort to prevent dry streaks like this, Bungie announced it's making some changes to the way some weekly activities and rewards are rotated. Ada-1's inventory is the most topical change, and one of the most welcome. Starting in Destiny 2 update 2.2.1 - which is "tentatively scheduled" for Tuesday, April 9 - Ada will sell all Black Armory weapon frames every week. You'll still only be able to purchase two weapon frames per week by completing Black Armory bounties, but at least you'll be able to choose what weapons you grind for. I still want a better Hammerhead, and I never did get the perfect roll on a Blast Furnace pulse rifle, so this change can't come soon enough. Now we just need Bungie to buff the miserable drop rate on Gambit Prime weapons in The Reckoning. In a similar vein, Bungie says it will start monitoring the weekly Nightfall rotation more closely to prevent "streaks where specific Nightfalls appear multiple weeks in a row or don’t appear at all for months." These streaks can prevent players from obtaining Nightfall-specific drops and various triumphs, so it'll be nice to see Bungie curate Strikes more carefully. It's unclear if this improved curation will also arrive in update 2.2.1, but given the timing, I'd assume so. 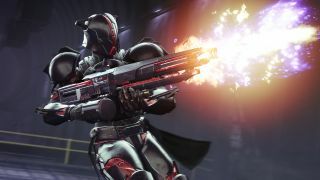 As previously reported, Destiny 2 update 2.2.1 is shaping up to be Quality of Life: The Update, with myriad long-requested changes to accessibility and RNG on the way. Perhaps most importantly, the drop rates on Dreaming City cosmetics and One Thousand Voices are getting a buff.